Like any other Kubernetes resource you describe a GameServer’s desired state via a specification written in YAML or JSON to the Kubernetes API. The Agones controller will then change the actual state to the desired state. Since Agones defines a new Custom Resources Definition (CRD) we can define a new resource using the kind GameServer with the custom group stable.agones.dev and API version v1alpha1. The length of the name field of the Gameserver should not exceed 63 characters. container is the name of container running the GameServer in case you have more than one container defined in the pod. If you do, this is a mandatory field. For instance this is useful if you want to run a sidecar to ship logs. portPolicy has two options Dynamic (default) the system allocates a free hostPort for the gameserver, for game clients to connect to. And Static, user defines the hostPort that the game client will connect to. Then onus is on the user to ensure that the port is available. When static is the policy specified, hostPort is required to be populated. containerPort the port that is being opened on the game server process, this is a required field. protocol the protocol being used. Defaults to UDP. TCP is the only other option. health to track the overall healthy state of the GameServer, more information available in the health check documentation. template the pod spec template to run your GameServer containers, see for more information. 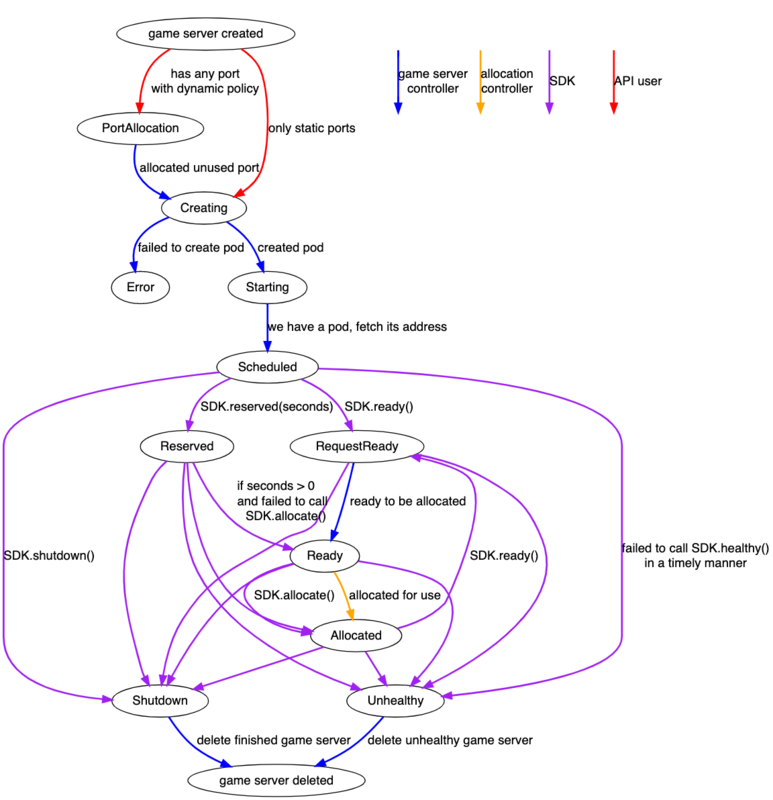 The following diagram shows the lifecycle of a GameServer.